Palm Beach was quite the colorful, charming and delightful surprise. 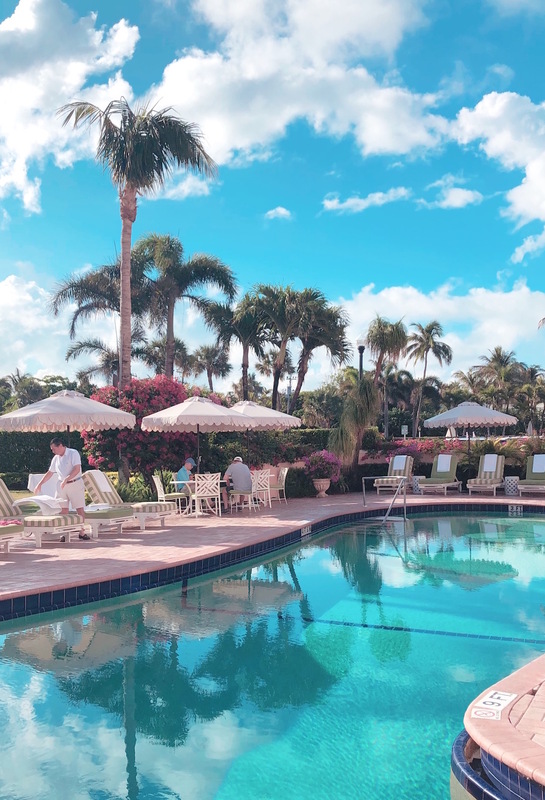 Where to stay: The Colony Palm Beach was an absolute gem. I can’t rate this hotel high enough; the branding, the people, the pool, the scallop trim, the palm print carpet and white vintage bikes. 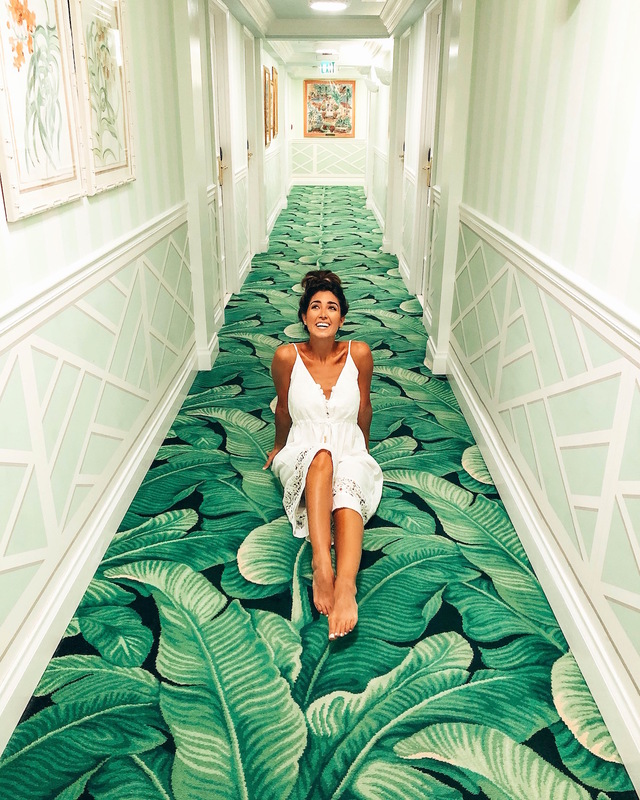 We seriously could not get over the darling details that filled every nook and corner of the hotel. I did not partner with this hotel, so this is in no way sponsored – just speaking from the bottom of this head-over-heels heart. 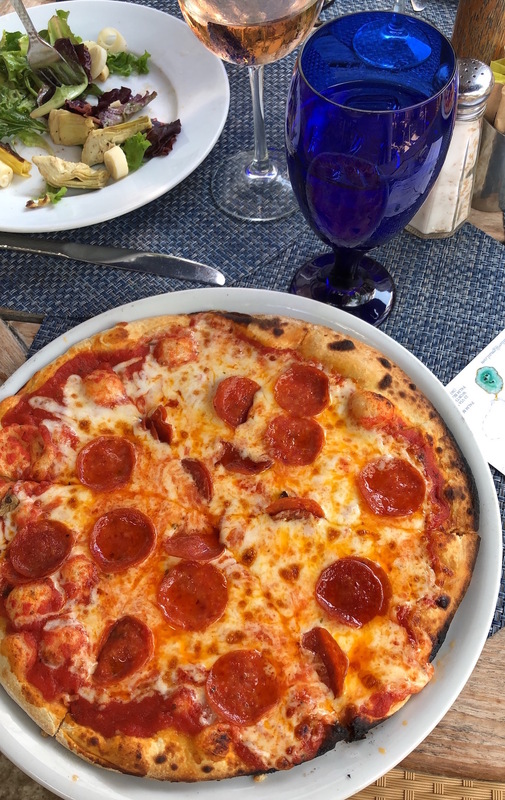 Pizza Al Fresco – true Italian pizza, comparable to tastes we had in Italy itself – the pizza was truly incredible. Not to mention the outside courtyard was absolutely darling for a late night meal and a rose-filled lunch. This was our favorite pizza to taste test in a long time! Moreover, it’s tucked away in the most darling nook off of Worth Ave.
Saint Ambroeus at the Royal – the most beautiful, colorful, girly and charming setting, Saint Ambroeus was just as delicious as it was swoon-worthy. The spot will surely make it on your IG. Seafood Bar at The Breakers – Delight in oysters and sip rose while you sit at an aquarium bar. The bar is filled with fish and they swim around your rose (not kidding here) while you stare outside at the view of the ocean. You may have seen it on my Instagram story – it quickly became one of our favorite bars ever! Renatos – We grabbed a drink here while waiting for pizza at Pizza Al Fresco, and the authentic Italian ambiance mixed with the piano was absolutely charming. Buccan – We didn’t get a chance to make it here, but heard great things from our sweet photographer, Christina Cernik. 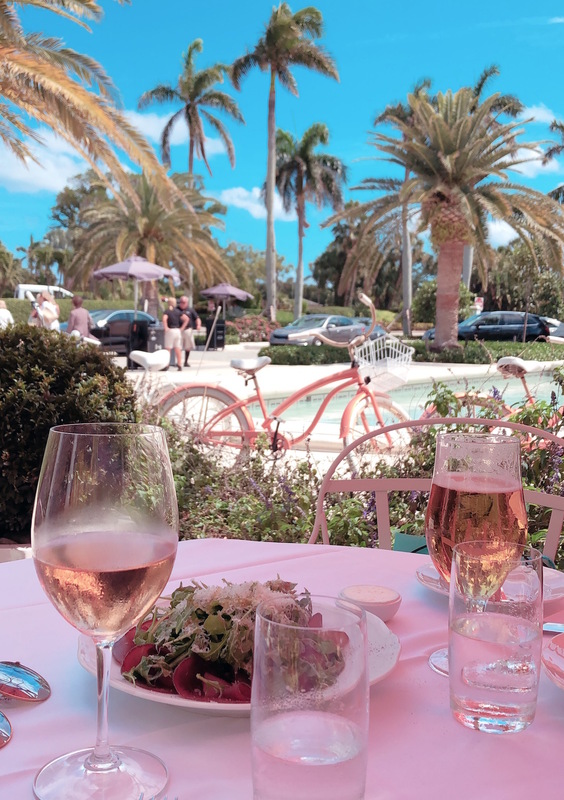 The Colony Hotel – We absolutely loved eating here from breakfast to occasional lunches to a bottle of rose on ice poolside. The scene is too sweet for words. Bricktops – Upon our arrival at Palm Beach mid-afternoon, we set out from The Colony Hotel to discover our surroundings. We stopped in at Bricktops for a glass of wine and appetizers and were not disappointed. Next time, we’ll go back for dinner! Lake Trail bike route – Biking was one of our favorite momentos from the trip, and the lake trail swerves beautifully between the ocean and perfectly polished flowers. 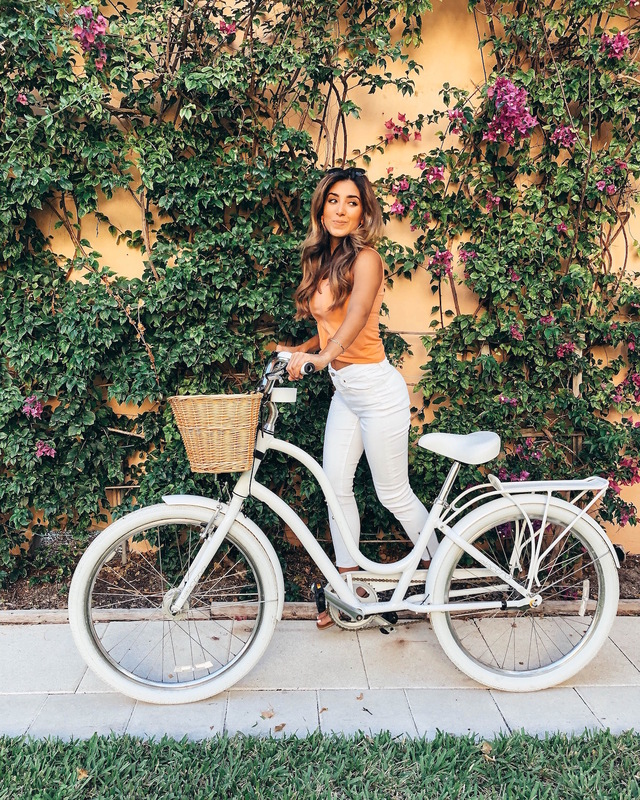 Worth Avenue – The Rodeo Drive of Palm Beach. You can’t miss it! The best part are the little shops behind the large designers shops on the ave. The hidden boutiques are beautiful! The Royal Plaza x Sant Ambroeus – probably our favorite backdrop for lunch and the most beautiful scenery to boot. You must try the fish at Sant Ambroeus; we adored it! The Colony Hotel – even if you don’t stay here, pop in for lunch or dinner. It’s that darling. 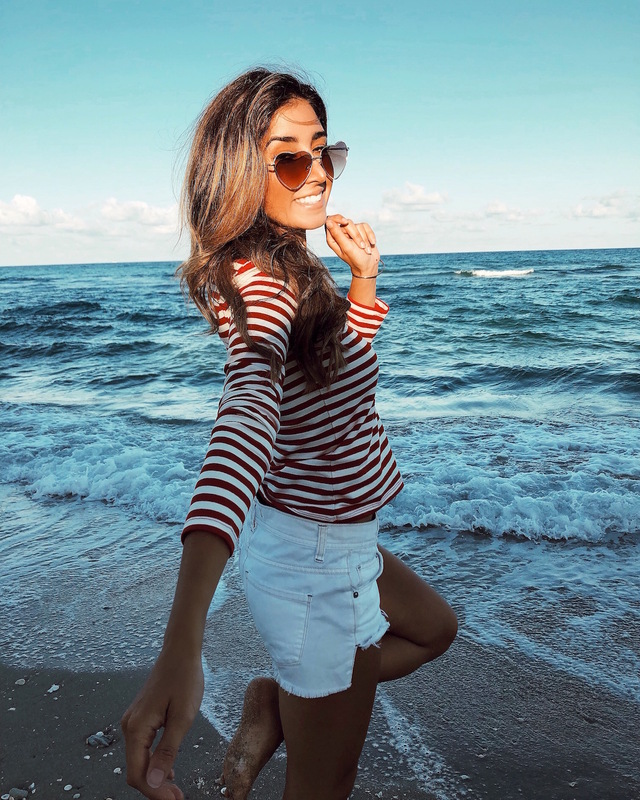 The Sea Wall – Situated across from The Colony Hotel, Palm Beach is known for it! Bethesda Church – our photographer told us about the church; although we didn’t make it over there, I heard it was a gem! The Breakers Hotel – stunning, magnificent and historic, the Breakers Hotel is a vintage and chic hot spot on the island. Grace Boutique – The cutest clothes in town! Apparently they are closing their doors this year, but pop in while you can! The Royal Plaza – This plaza is a shopping oasis, with designer shops, yoga, and lovely eateries. Worth Ave – Again, feast yourself on designer eye-candy – but be sure to check out the little nooks of shops in between. MY PHOTOGRAPHER: My mom took all the iPhone pics shown here, but a big shout-out to Christina Cernik for the most darling and delightful shoot. Christina was such a treat to work with and you can find her on Instagram here. Great photos! Everything looks so beautiful and relaxing. I need a trip now lol! Now I definitely want to visit Palm Beach! I love your outfits, especially that adorable yellow number! I could use a beach vacation!! It keeps snowing in Michigan!! I’m jealous 😉 Beautiful places and pictures!